Stuntman/actor Frank McGrath was born of Irish and Native American heritage in Mound City, MO, February 2, 1903. In his pre-Hollywood earlier years he had some experience with small time rodeos then went on to be a jockey at midwest race-tracks. When a Mexican track went broke, Frankie hopped a north-bound freight train. As legend has it, a movie producer saw Frank jump from the train and encouraged his entry into early film stuntwork. Supposedly, at 16 years of age in 1919, Frank began his film career working and doubling for Stan Laurel, Buster Keaton, Warner Baxter and J. Carroll Naish, just to name a few. Frank was 5' 8" so his small frame and wiry movies also enabled him to double a lot of female stars such as Gene Tierney. In the ‘30s and ‘40s McGrath began to get small speaking roles along with his stuntwork. He can be seen in “Rainbow Trail” (‘32) with George O’Brien, “Western Union” (‘41), “Sundown Jim” (‘42), “Heldorado” (‘46), etc. 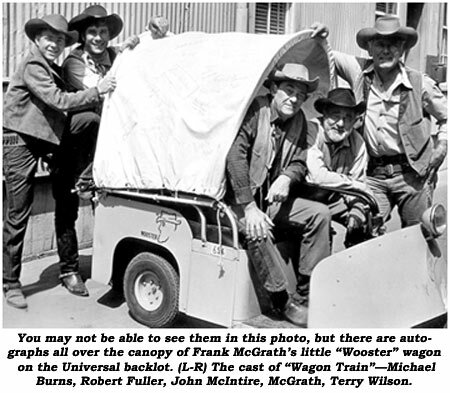 Frank and his long time friend, Terry Wilson, became part of John Wayne’s stunt crew on “Hondo”, “Fort Apache”, “Rio Grande”, “Three Godfathers”, “She Wore a Yellow Ribbon”, “The Searchers” and dozens more. At the time, the TV series “Wagon Train” was being prepped in ‘57. Frank was ready for retirement after more than 40 years in the business but his friend, actor Ward Bond, was very persuasive and instrumental in getting Frank cast as irascible cook Charlie Wooster. An 8 year run on “Wagon Train” brought belated fame and recognition to Frank and Terry Wilson, making them popular guest stars at many top rodeos and fairs across America and Canada. 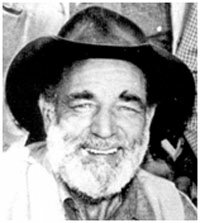 Frank kept working as an actor after “Wagon Train” ended its run and played Uncle Lucius on the “Tammy” TV series. Over the years Frank worked on such classic westerns as “Westward the Women”, “Devil’s Doorway”, “Naked Spur”, “Tin Star”, “Last Challenge” and many non-westerns including the best ever version of “The 3 Musketeers” (‘48) starring Gene Kelly. Sadly for all of us, Frank passed away of a heart attack May 13, 1967, but is still seen worldwide in “Wagon Train” reruns and almost nightly in a John Wayne film being shown somewhere. He left his mark and helped pave the way for stuntmen to come.